A fine footballer whose career journey saw him play 209 games for three clubs, Brenton Sanderson became Collingwood's forward line coach in 2016. It was something of a homecoming for the 42-year-old, who played four games for the Magpies in 1994. His football career began with SANFL club Sturt before joining Adelaide in 1992. He debuted as a teenager, playing six games across two seasons before transferring to Victoria Park. It was at Collingwood that Sanderson lived with fellow new recruit Nathan Buckley. At the conclusion of a 13-year player career, Sanderson moved to Port Adelaide as a development coach. He only spent on year in the role before moving back to Geelong, where he served as an assistant between 2007 and 2011. During that time, he played a key role in the '07 and '09 premiership triumphs, and contributed greatly to Geelong's charge to the '11 decider before being selected by Adelaide as its senior coach for 2012. In his first season in the top job, Sanderson led the Crows from 14th to third, finishing just six points shy of Hawthorn in the Preliminary Final. Unfortunately, the Crows failed to reach the heights of 2012 in the two years that followed, with Sanderson leaving the club at the end of the 2014 season. He has served as coach of the AFL-AIS Academy, where was tasked with guiding the best young footballers in the country on their journeys to the elite level. At Collingwood, Sanderson oversees Collingwood's forward line and ball movement. 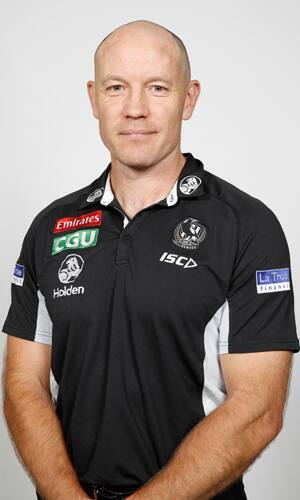 Coaching Career: Port Adelaide - development coach (2006), Geelong - assistant (2007-2011), Adelaide - senior coach (2012-2014), AFL National Academy - head coach (2015-2016), Collingwood - assistant coach, forward line (2017-2018).